M MMIMP 1nmtiw *1 1- .! I iti.tr I w .
BUREAU OF ENT iNIMu .1;Y CIi'ULT'.A.I No. I166. L U h1I AK.\IX IAn.I jBB t wl ( kuld 4a BB lu-1. AS A SlRK.K1'II n XJTt I.\~I S1XTI(rI)F<. L. 0. HOWARD, Enl/ioif l,,h.i% and I'lif of Bureau. C. L. MARLATT. ,lo,,iitoiiijiI and Acting I'li, f in Absence itif . '1 f.
R. S. ('i IIiN. Executire Assistant. W. F. 'TASI. LT. ('hi" f Clerk. F.H. CHITTENDEN, in .eairgf of truck crop afind stored product insect i,,, ,liqfintion. A. D. HOPKINS, iln ,lii !i of forest insect investigations. W. D. HUNTER, in charge of southern field ,'.r,, insect it,, li'ifli, viii. 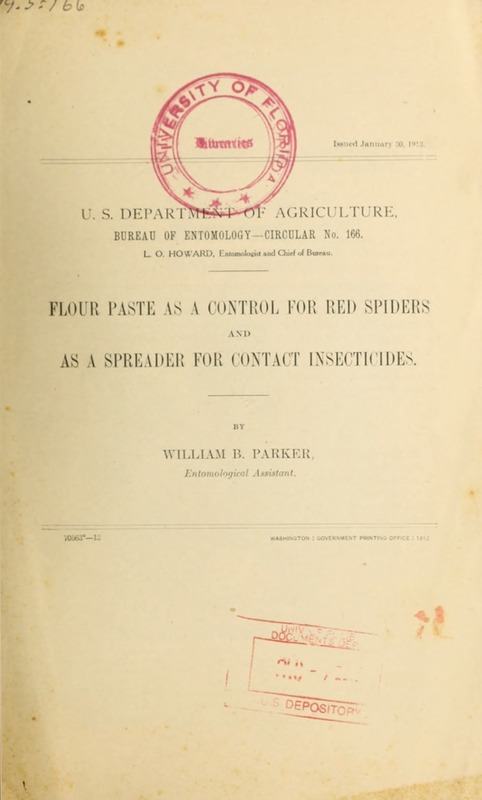 F. M. WEBSTER, in lvt iiit' of (I.l, iil and forage insect investigation, . E. F. PHILLIPS, in charge of bee culture. D. M. R1OI.EtS. in nr'!/( of preventing spread of moths. pf ItI work. ROLLA P. CU-RRII. in charge of editorial i,',..
MABEL Coi COR)D. in charge of library. TRUCK CROP AND STORED I'ROi'1l T INSECT IN\ %.SrI(,ATIONS. F. I1. CTITTEN.\EN. iln lulrji,. STON, JOHN E. GRAF, C. F. STAHL, D. E. FIN K. into(iiioiniitVIl am.-i.-oxiitl. A. B. DUCKETT, scientific assistant. I. J. CONDIT, collaborator in ('0ltiiri,,,. W. N. ORD, collaborator in Oregon. THOMAS H. JONES, c',llailiirnltr in P,rlito Iir'o. MARION T. VAN HORN. PAULINE M. JOHNSON, ANITA M. BALLINGER. jii'reipiarators. L. 0. HOWARD, I ., i Chic, ( :>( B. reau. AS A SlClE.tll:Ill FOI1 (ONTAC'T INSI .UTIICIDES. ]i ... ,, .t, ,f i.,1 1 m lv l ti l.
1iI sn I IS rl I X I;I: I M I N'I . I LU'l PIAST'rE AS A CONTROl. FOR RED SPIDERS. it w";a- ol-(. 'r\eI' tll tht t i mixture spread ver thle leaves very readily. -,pra.y. w\ ith and witltout thle flour pate. for the red spider on hops. I Illh I, 'of V'iliffoi it/. 1912. From the preceding table it is very evident that flour paste, 4-100.
is a very effect ive spreader for nicotine sulphate. writer, but it was deemed advisable thoroughly to illustrate this point. .sn 'in h l .iil I: ll. o, luern %%illi !Ill\ ,"-iillTiln ii .l lld I ,ll *i p .i-hl 4- I11 . T h li t u nlimi. --i1i,1c.1 I II lilt-. \ -i ly i l i i- li-. txpit,,l'inlt, il1- \ t'l'' I'lil liil' .l il io n ll r I ilv 'I.,I )I ,l Ih '. iili r ,,. I",' /i 111 / ,n ,,,iii ,,'iir t,. I 'ill,. ., ** ,< ,#i/i'11i t lfllJ. J,Inp 27 1117s W 17.
tr.rnii, i.ii i. r I7lu9 . -. h.e.. e.. ......... .
.\U II l .l I,) ... ',W ', *"
Tihl ,'ii l . . 1, 712 .. 1..-. .
\vrl\ fi1<'oiil-;i~iin~r l'r-nit-. ;iirl nl i- \r'r\ |~ii<>l)hillt that flo111 palste. ii ll. e in'n ilt-, .l . 'r .plli, '- l A\ill, ;i 97 per tl icent r.lli,"ii, y. 'IThese w,11 i l 'llo i li i' ..ill-. Iuil l.i .1 ,\pleri enlt n its pr,n,%rl that. 'i |'i~i r tl l inli-. I I (I ,l l I'%,",11 \1 \ % I \ i' IH I -I: lIED -I' 1,1 ;-. 1 LOUR P.\'I'E AS A CONTROL FOR RED SPIDERS. free to perform its natural functions. high as 12 pounds to 100 gallons no injurious effect resulted. vent pollination or injure the appearance of the scales. i I'l'r-niilei ilini (may spot leaves if Pear. li--nl too near I'.l' iiiiih-" time). Prune. Cucumber. greenhouse .hiid ti.u '. ioets, field and greenhouse. cient water to make up for evaporation. is but a slight disadvantage, and is necessary with most materials. fl nin.i and as a "sticker for arsenicals has not yet IwIn w orke l it. it iii:iv have some i alue ;ili,' these lines. S 'cJctI ,/." .' 1 .. a* tifi'. YASIIIN (;TON, I ). (U'., X\ovt ,u r c 1:'12. FT Ot r %'- i, AS A I .I I\ 1 'OHR ED I S t'ItI'l-:I.